As a child of the eighties, The Snowman is a long-established part of my childhood Christmases, sitting down to watch the film adaptation of the Raymond Briggs book in front of a roaring coal fire with a mince pie . . .
What I hadn’t realised until very recently is that the live show first appeared on stage over twenty years ago – there was me thinking this was a new thing! 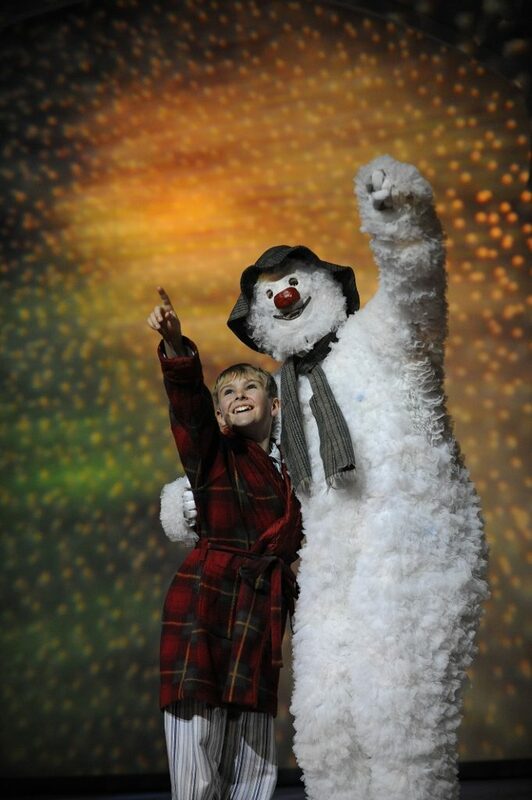 The Snowman is currently running Opera House Manchester, providing a glorious starting point to our festive season. Although Ben, Chloe and Amy have most definitely seen The Snowman on tv and have ‘read’ the book, I don’t think they’re all that familiar with the story so at first they were a little unsure as to what to expect from the show. 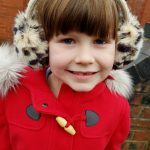 Just like the book and the film, there’s no words – the story is told entirely through music and dance – which is utterly beautiful but certainly a new experience for the likes of Amy who has only just turned 4 this week! At first I think she was a little confused by the fact that nobody was talking but she soon settled into it and was completely absorbed by the magic happening on stage in front of her. The set and costumes were very clever, and as is usually the case Ben was keen to figure out what might be going on backstage as we moved from scene to scene – he finds stage trickery absolutely fascinating but it’s a little frustrating at times when he’s trying to explain things to the girls instead of just letting the magic wash over them! I adored the way the scenery referenced the book and film so closely whilst adding it’s own twist. For me the highlights of the show included the opening scenes which, from memory, mirrored the opening scenes of the film very closely – I felt like move for move I was watching the Christmas film of my childhood come to life on stage in front of me. And then the iconic flying scene with Walking in the Air sung by Aled Jones (as featured on the album One Voice at Christmas) and some skillful use of wires gave me goosebumps from the start. 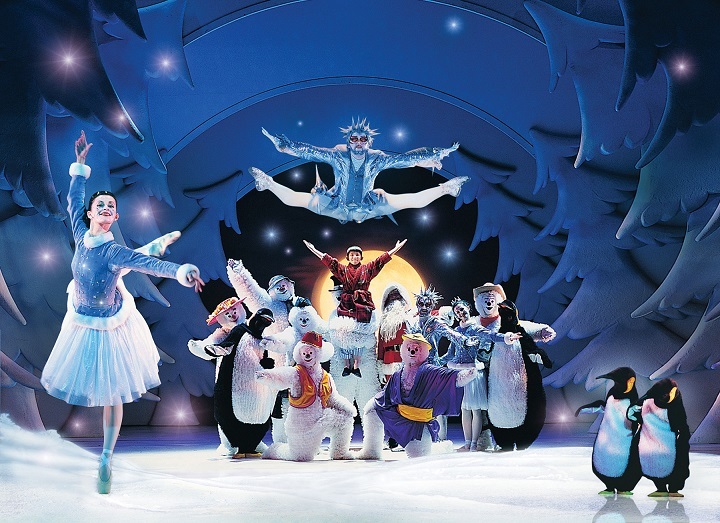 The stage show stays true to the original book and film adaptation whilst adding in elements such as bad guy, Jack Frost to give the show it’s own identity. We loved the “battle” between The Snowman and Jack Frost to win the Ice Princess (who wowed my girls by “dancing on her toes like a proper ballerina“) and Scotty Snowman raised a lot of laughs from the grown ups with the way he chose to deal with Jack Frost! 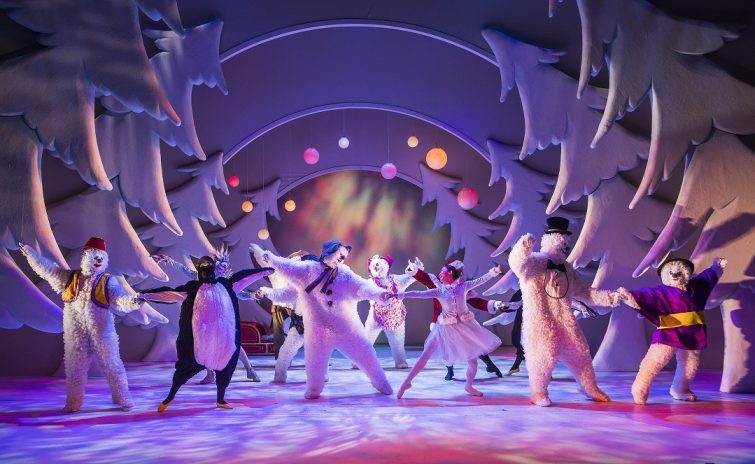 The magic of The Snowman runs through the show from start to finish – the music, the costumes, the beautiful dancing and even a smattering of fake snow at the very end. I was almost reduced to tears when it had finished – my children were as enchanted as I was. It’s worth considering that with a running time of 1hr and 45 minutes (including an interval) this is a long time to sit and watch a show with no talking or interaction – and as such I don’t think I would take anyone younger than Amy. She was definitely pretty fidgety in the run up to the interval and spent the second half sat on my knee whispering to me about what was going on. She’s a pretty sparky little girl and had a good grasp of the story being played out in front of her but I know the lady sat behind me said her son, who is almost 5, wouldn’t have been able to sit and watch it. Although it’s a children’s book – I do think the show itself is quite grown up in a lot of ways. Chloe and 6 and Ben at 8 were perfect for it. The Snowman runs at Opera House Manchester until Sunday 12th November before moving on to Glasgow, Milton Keynes and Brighton. Tickets are available here. You can also see what Sarah from Extraordinary Chaos and Jenny from The Brick Castle thought of the show. Where we previously lived in Bracknell we had a great theatre down the road. Before little Mr. came along we’d go down every Christmas with daughter.